Can’t find veal shanks? Try making this short rib osso buco to get the traditional flavors of the dish with a new cut of meat. It’s been a while since we had Friday Night Dinner, hasn’t it? Don’t worry. It’s not going away. We’ve just been plagued with sickness and I’ve been feeling a bit uninspired as of late. I’m sure it has something to do with the weather – January was a pretty gloomy month this year. But, this short rib osso buco has brought me back from the darkness, because it is nothing short of perfection. In the episode, Paris is Burning, Max makes Lorelai osso buco, and she proceeds to sit on the counter eating it while he’s cleaning up. It’s really the beginning of the end of their relationship, because by the end of the episode they’ve broken up. 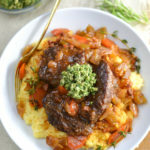 But, for some reason, I find the idea of this osso buco charmingly romantic, which is why I saved it for Valentine’s Day. Ok, just kidding, I saved it because I was intimidated by the idea of it, and I couldn’t find veal shanks to save my life. But, it turns out you don’t need veal shanks to make osso buco. I’ve created a short rib osso buco that can be made with bone-in or boneless short ribs. Besides, I’m surprised that Lorelai would even eat veal shanks, considering her taste is not that different from an eight-year-old’s. Either way, the short rib osso buco turned out amazing, and it’s going to be my new go-to meal when I’m looking for something wow guests. I served it with a horseradish gremolata and roasted garlic polenta. You could totally do mashed potatoes, but you’ll definitely want a side that goes well with gravy/juices because there’s a crazy amount of flavor there. Heat a large dutch oven to medium-high. Add pancetta and sauté until fat has rendered – about 5 minutes. Remove from pan and set aside. Season short ribs liberally with coarse salt and black pepper. Add to remaining pancetta oil, and brown all sides. Remove from pan and set aside. Add olive oil, onion, celery and carrots with a pinch of coarse salt. Sauté, stirring occasionally, until onions are translucent and vegetables have softened – about 5 minutes. Add tomato paste, white wine, and beef broth. Stir until tomato paste is incorporated into liquid. Return pancetta and short ribs to pan with thyme, rosemary and bay leaf. Cover and bring to a boil. Reduce heat to a medium-low and simmer for 1 1/2 – 2 hours. Remove lid for the final 20 minutes of cooking to thicken sauce. Process all ingredients in a food processor until the consistency of a pesto is reached. It really is delicious! I’m sure you’ll love it. This dish looks so delicious, Melissa! It looks so colourful, the flavour combination is really good!